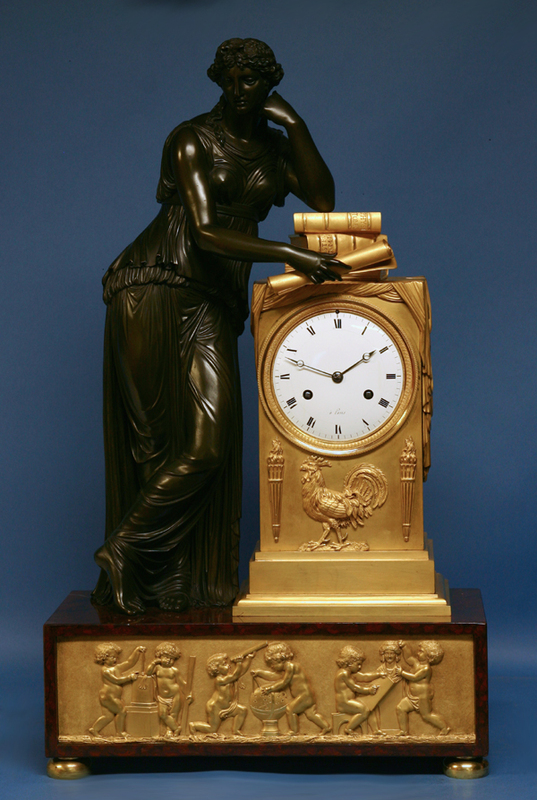 c.1815 Large French Ormolu, Patinated Bronze and Red Variegated Mantle Clock. 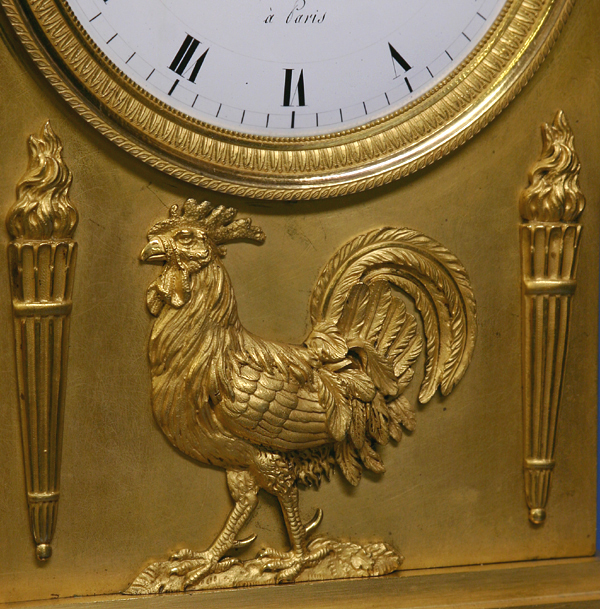 A large and important French Empire figural mantle clock. 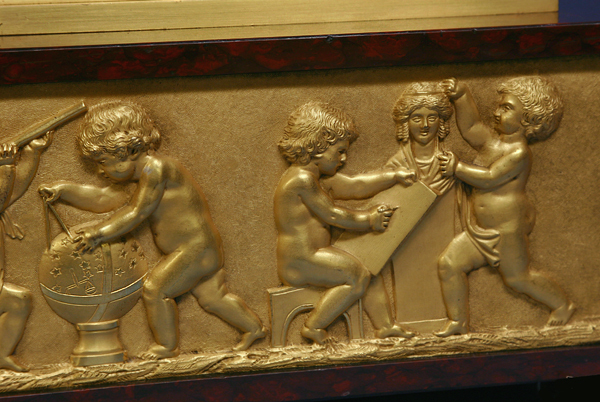 The ormolu case with a stepped plinth has an extremely well cast and finished cockerel flanked by flambeaus, is covered by a drape and is surmounted by stacked books. 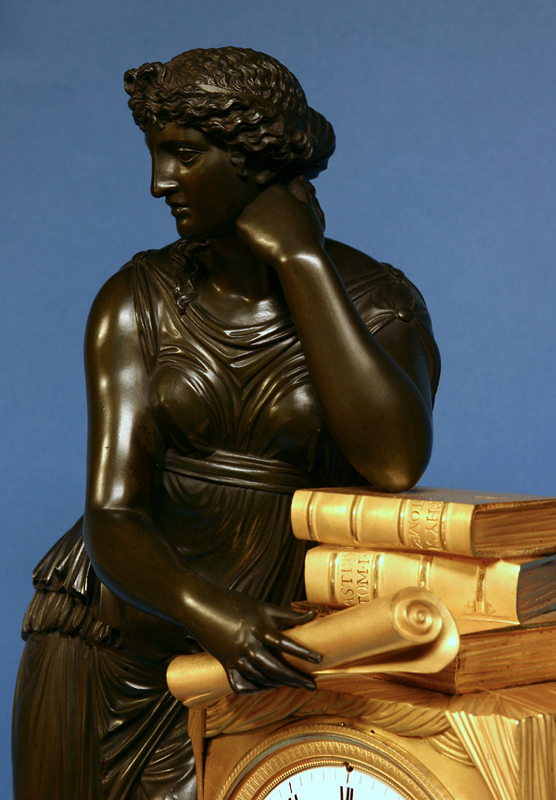 The superbly cast patinated female, the personification of ‘Study’, is dressed in flowing classical attire, clutches a rolled ormolu scroll and casually leans upon the top book. 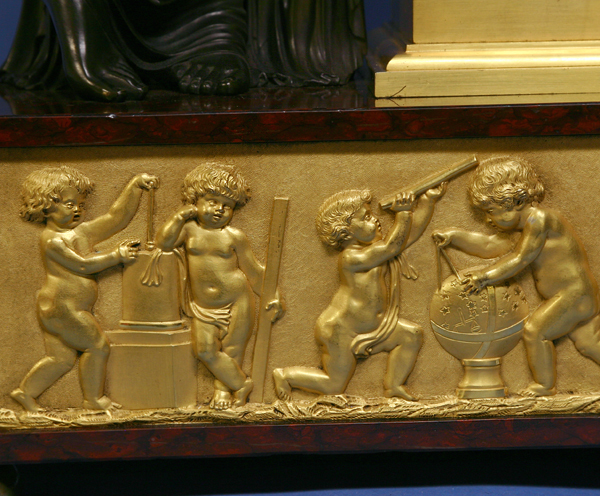 The whole stands upon a red variegated marble base with bun feet that incorporates a wonderfully detailed frieze done in very high relief and depicts putti personifying ‘Industry’, ‘Astronomy’ and ‘The Arts’. The well-lettered white porcelain dial has black Roman numerals for the hours, ‘a Paris’ centered below and steel Breguet-style hands. The eight-day time and strike movement has the fast/slow out the dial, the letter ‘F’ stamped on the backplate, countwheel striking on a bell and still retains the original silk-thread suspension. 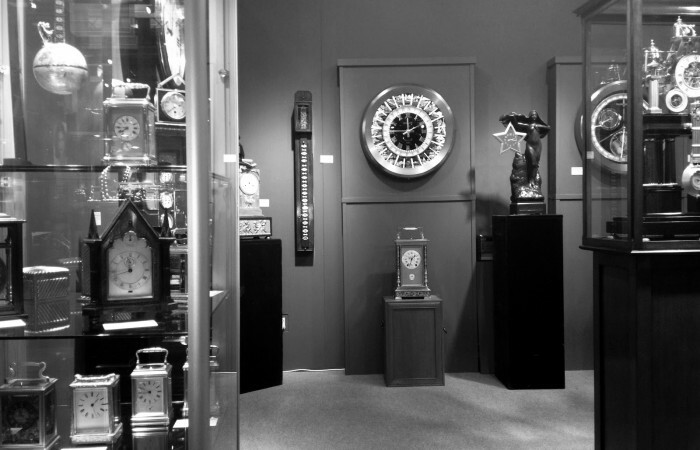 Ottomeyer and Proschel attribute the design of this clock to Pierre-Victor Ledure. 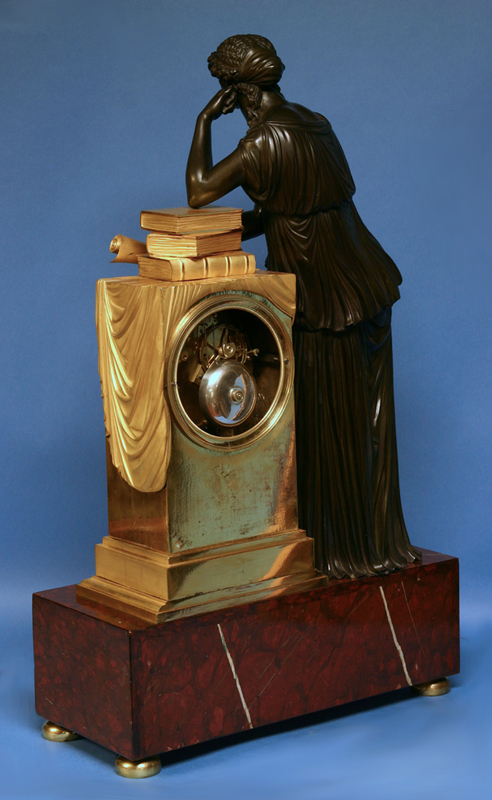 Ledure was one of the leading bronzers of the early nineteenth-century and had apprenticed under the renowned bronzer André-Antoine Ravrio. 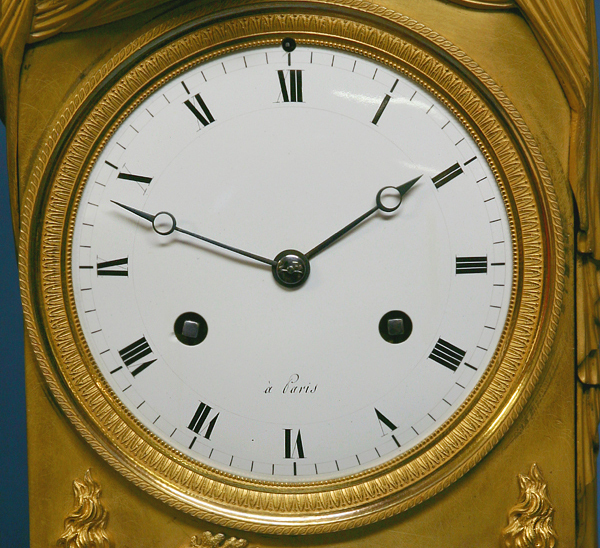 Similar clocks are in the collections of the British Embassy in Paris, The Viana Palace in Madrid and the Brighton Pavilion. ‘European Pendulum Clocks’, Maurice, pg. 82. ‘Vergoldete Bronzen’, Ottomeyer and Proschel, pg. 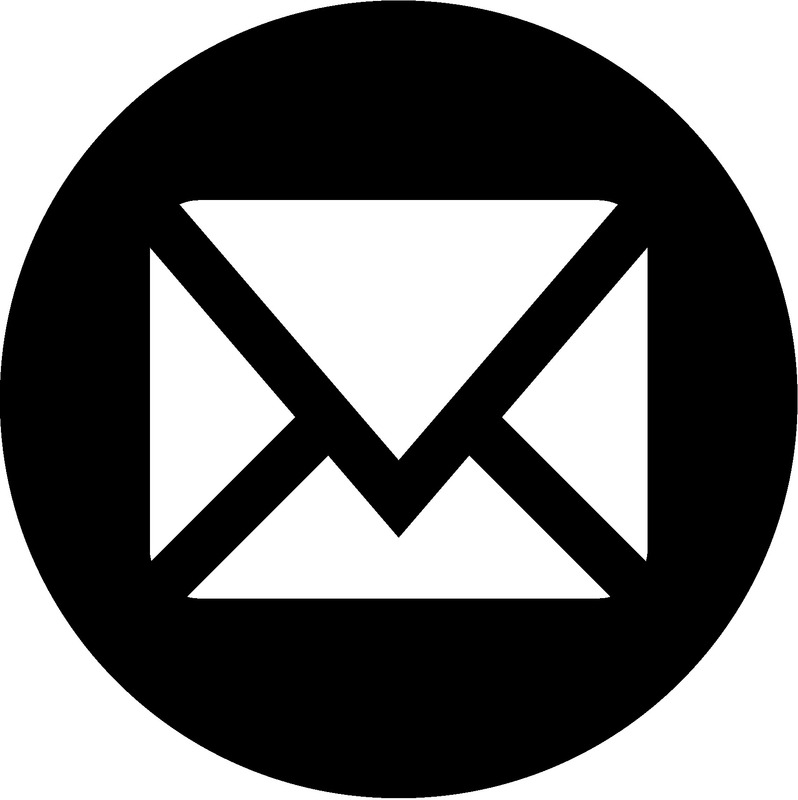 349.